a hemorrhagic disease characterized by extravasation of blood into the tissues, under the skin, and through the mucous membranes, and producing spontaneous bruises, ecchymoses, and petechiae (small hemorrhagic spots) on the skin. (See plate in Dermatology Atlas.) When accompanied by a decrease in the circulating platelets, it is called thrombocytopenic purpura; when there is no decrease in the platelet count, it is called nonthrombocytopenic purpura. adj., adj purpu´ric. There are two general types of thrombocytopenic purpura: primary or idiopathic, in which the cause is unknown, and secondary or symptomatic, which may be associated with exposure to drugs or other chemical agents, systemic diseases such as multiple myeloma and leukemia, diseases affecting the bone marrow or spleen, and infectious diseases such as rubella (German measles). Symptoms. The outward manifestations and laboratory findings of primary and secondary thrombocytopenic purpura are similar. There is evidence of bleeding under the skin, with easy bruising and the development of petechiae. In the acute form there may be bleeding from any of the body orifices, such as hematuria, nosebleed, vaginal bleeding, and bleeding gums. The platelet count is below 100,000 per cubic millimeter of blood and may go as low as 10,000 per cubic millimeter (normal count is about 250,000 per cubic millimeter). The bleeding time is prolonged and clot retraction is poor. Coagulation time is normal. allergic purpura (anaphylactoid purpura) Henoch-Schönlein purpura. annular telangiectatic purpura a rare form in which pinpoint reddened lesions coalesce to form a ring-shaped or continuously linked pattern, commonly beginning in the lower extremities and becoming generalized. Called also Majocchi's disease. fibrinolytic purpura purpura associated with increased fibrinolytic activity of the blood. purpura ful´minans a form of nonthrombocytopenic purpura seen mainly in children, usually after an infectious disease, marked by fever, shock, anemia, and sudden, rapidly spreading symmetrical skin hemorrhages of the lower limbs, often associated with extensive intravascular thromboses and gangrene. purpura hemorrha´gica primary thrombocytopenic purpura. Henoch's purpura a type of Henoch-Schönlein purpura in which abdominal symptoms predominate. Henoch-Schönlein purpura a type of nonthrombocytopenic purpura, of unknown cause but thought to be due to a vasculitis; it is most often seen in children and is associated with clinical symptoms such as urticaria and erythema, arthritis and other joint diseases, gastrointestinal symptoms, and renal involvement. 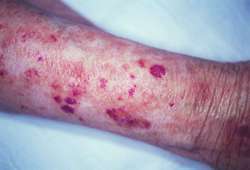 Called also Schönlein-Henoch purpura or syndrome and allergic or anaphylactoid purpura. idiopathic thrombocytopenic purpura thrombocytopenic purpura not directly associated with any definable systemic disease, although it often follows a systemic infection; the cause is thought to be an IgG immunoglobulin that acts as an antibody against platelets, causing ecchymoses, petechiae, and other bleeding. There are both acute and chronic forms: the acute form has a sudden onset, is more common in children, and usually resolves spontaneously within a few months; the chronic form has a slower onset, is more common in adults, and may be recurrent. nonthrombocytopenic purpura purpura without any decrease in the platelet count of the blood. In such cases the cause is either abnormal capillary fragility or a clotting factor deficiency. Schönlein purpura a type of Henoch-Schönlein purpura in which articular systems predominate; called also Schönlein's disease. purpura seni´lis dark purplish red ecchymoses occurring on the forearms and backs of the hands in the elderly. thrombocytopenic purpura purpura associated with a decrease in the number of platelets in the blood; see purpura. thrombotic thrombocytopenic purpura a form of thrombotic microangiopathy characterized by thrombocytopenia, hemolytic anemia, bizarre neurological manifestations, uremia (azotemia), fever, and thromboses in terminal arterioles and capillaries; some authorities consider it identical to the hemolytic uremic syndrome. Called also microangiopathic hemolytic anemia and Moschcowitz's disease. the occurrence of petechiae and ecchymoses on the atrophic skin of the legs in aged and debilitated patients. a skin condition affecting older people and characterized by fragile blood vessel walls that rupture on minimal trauma. Also called senile purpura.